League of Legends is a game everyone is talking about at the moment; an online arena style game which quickly gained a solid fanbase back in 2009. You play as an unseen force which takes control of a specific ‘champion’. As a champion you fight against other teams with the end goal being to destroy their base. Jinx is a popular character from the game who as the name would suggest loves causing mischief and mayhem. Carrying two main weapons: her shock pistol and rocket launcher which help her wreak havoc with colorful explosions wherever she goes. 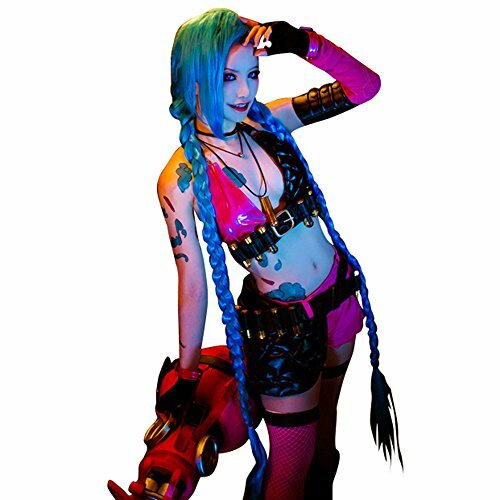 If you want to put together a striking Jinx League of Legends Costume for cosplay conventions or Halloween then we have you covered. We’ll be looking at everything you’ll need to put together her outfit including wig, cosplay, accessories and boots. Without further ado let’s get into it! The first item you’ll need is a wig. 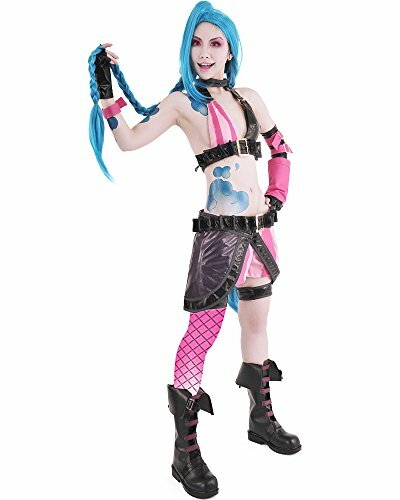 Jinx is known for her long blue hair with ponytails that go down to her back. 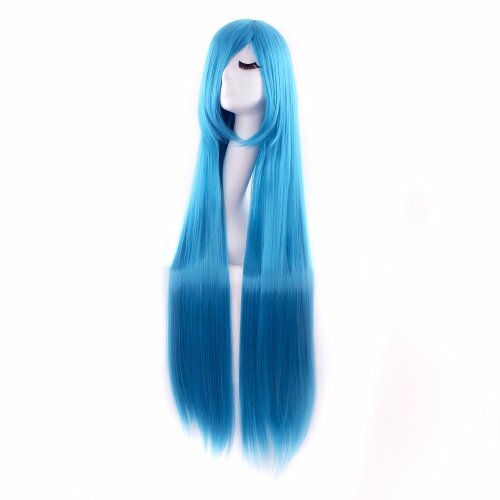 The selection of wigs for this character is limited so if the pre-styled wigs aren’t available when you go to buy you’ll need to go for a generic blue wig which you can style yourself. Alternatively dye your natural hair and plait the ponytails. Now onto the outfit itself. Once again there are very few options available for this character so make sure you order well in advance to avoid disappointment. This cosplay includes: bra, cartridge belt , shorts, apron, gloves and arm guards. 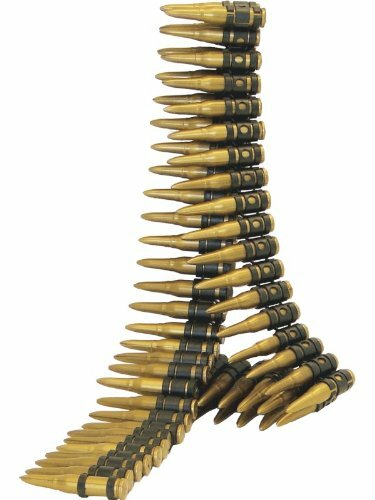 Add a bullet belt accessory across your chest and waist for added authenticity. Now it’s just to add the finishing touches. You’ll know the character wears a pair of pink fishnet tights over a pair of purple stockings. All that’s left is a pair of black combat boots and you’re set to go. Makeup will help bring the whole outfit together so here is a quick three minute tutorial for more details with text instructions below. Before you begin put in red contacts. Now begin with a beige foundation over your regular face primer. Apply your concealer, paying close attention to your under eyes to cover dark circles and brighten the centre of your face and finish by powdering everything. Now begin outlining your eyebrows with a brown brow pen very high and arched, then take a blue pencil and brush on over the brows. For the eyes use reddish eye shadow all over your crease and soften it out, after that use lighter shadow to brighten your lights. Finally take a black eye shadow and blend it between those two focusing on the corner. To emulate the large anime style eyes Jinx has extend the eye shadow on your lower lash line. Using the same black shadow as before create a large wing and then go along the bottom. Finish with a pair of false lashes. After that start contouring your cheekbones and re-shaping your jawline. Using a cranberry lip liner begin outlining your lips accentuating the edges and then fill it in. Apply a similar color lipstick. To replicate her tattoos you can use a blue eye liner and make the cloud like designs, for the pink bullets use a pink liner instead. That’s everything you’ll need to transform yourself into this much loved League of Legends character! Before you leave check out our other tutorials on the blog and follow us on social media for updates on our latest blog posts.